Congratulations! You are now reading a post by James Dearden, of Technocrat Games, who is writing in the third person but will now stop. I’ve been interested in making games since I was in primary school, my earliest work being “Stonehenge Racing and Gardening”. 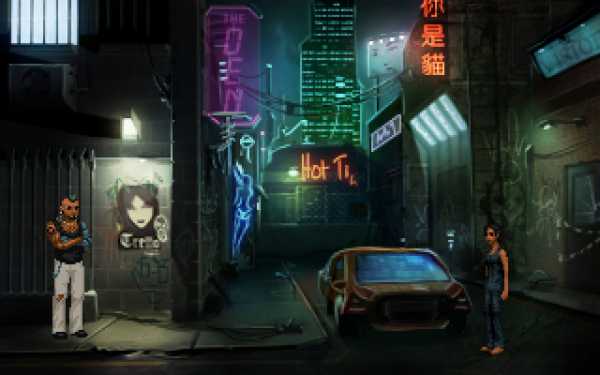 More presently though, I’m the writer of Technobabylon, soon to be the latest game to come from Wadjet Eye studios! Adventure games are very much a formative part of my youth. In 2010, while being extremely antisocial and hiding in my apartment in South Korea, I decided to make one for practice. This little game was Technobabylon: Part 1, a one-room “escape” adventure designed to see what I could do with AGS. I started getting messages of support about it, and so I pressed on with another part. Longer and more narrative, this one was the most popular, and by this stage I was starting to realise that there was potential for something bigger in this. No longer could I just pull plot from my backside, I needed to make a plan! With the third freeware part, I’d started on a framework designed to take place over a number of future instalments, but kept finding myself frustrated. I wasn’t a particularly good artist, and didn’t feel I could adequately express what I wanted to without being good enough. So, what did I do? Did I work hard and practice, until I had the skills I needed to succeed? Of course not, I found someone who could do it better! This led to Ben Chandler, AGS veteran and pixel-wizard, joining the project to lend his skills. Through him, I also got talking to Dave Gilbert of Wadjet Eye. 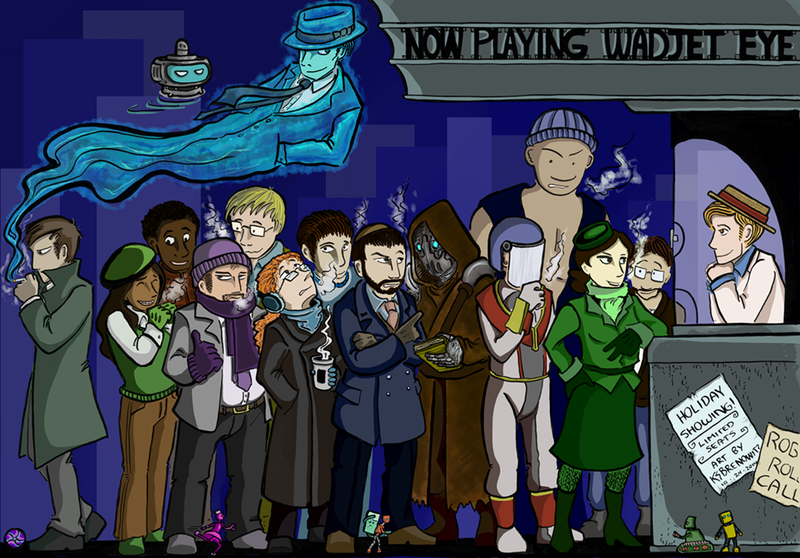 What had previously been an unrealistic best-case (“get Wadjet Eye to publish Technobabylon”) was actually happening! So, I realised I needed to make the best darned Technobabylon I could. Now a full-length game rather than a series of episodes, and with a style that screamed “retro cyberpunk”, Technobabylon has been coming along nicely into something more like I’ve spent the last four years trying to make it. In a couple of months, it’ll be playable, and you can see what’s happened with it – particularly if you’re one of the folk who played the episodes, and has been waiting for Part 4 since March 2011. It seems fitting to begin the first “real” entry of this new blog with a retrospective of the year that was 2014. You know, like everybody else. Might as well kick off the new year right. 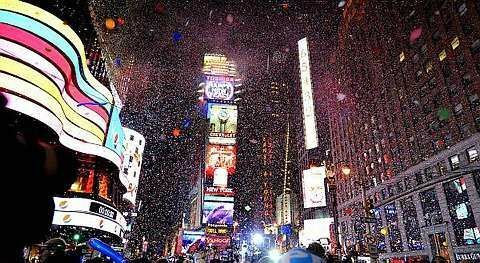 New Year’s Eve in Times Square is cold cold cold. I prefer watching it this way. On TV. 2014 was a year of adjustments. 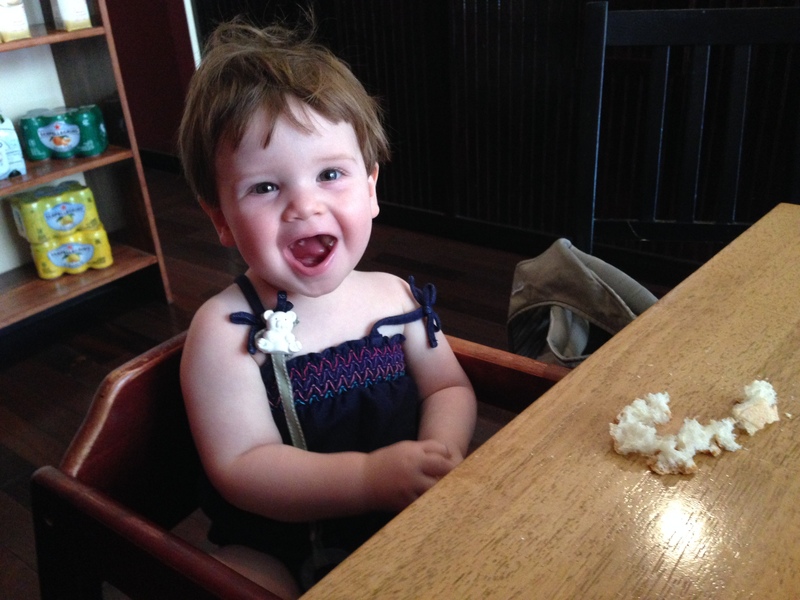 One year ago, Janet and I had recently moved to Brooklyn into a new apartment with our new baby girl, Eve. It was a huge change in many respects. Earning your living as a creative person can be a very rewarding life, but it can sometimes be a very selfish one. It requires you to spend a ludicruous amount of time living inside your own head, and it becomes very easy to neglect everything else. I have spent a lot of time over the last year struggling to make that adjustment and think outside myself. I wanted to become a better person so I could be a better dad. Eve smiles when she sees me, laughs if I make silly faces, and calls me “Daddy!” with excited eyes. So I can only assume I’ve done a good job. Eve appearing to love me. I’ve been told by other parents that I have about ten years until this changes. 2014 has been a year of endings – specifically the Blackwell series. On April 24th, the fifth and final game in the Blackwell series was launched. I released the first Blackwell game in 2006, and first conceived of the idea as far back as 2002. So these characters have been living in my head for a long, long time. It hurt to end the series – god, it hurt – but I knew it was time. I am still feeling the loss – it feels weird to hear about some arcane bit of New York history and realize that I can’t make a Blackwell game based on it – but at the same time I feel good about it. Epiphany is the game I am most proud of. It garnered the most positive reviews, has resulted in the most fanmail, and (most importantly!) had the highest profit record of any game we’ve done. If it had to end, I’m glad it went out on such a high note. So long, you two. It was a pleasure. 2014 has been a year of growing. At least, in terms of this company. One year ago we hired our first full time contractor- Ben Chandler, who did the art for Blackwell Epiphany as well as the upcoming Technobabylon and Shardlight. That worked out so well that we did it again. Francisco Gonzalez, known for his Ben Jordan series as well as the Wadjet Eye published A Golden Wake. Francisco has taken on a lot of things I would ordinarily do myself, which has enabled us to do many more things than we could do before. He’s taken on two projects and they are both in very good hands. So what’s in store for 2015? A lot, we hope! We have plans to port more of our catalog. 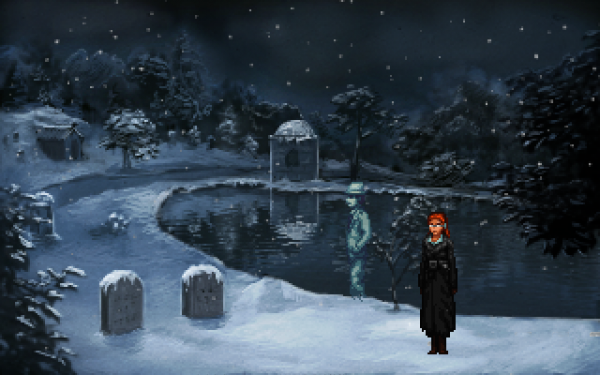 Janet has already pushed the first three Blackwell games onto iOS, and has been working to finish up the last two. After that she plans on starting the herculean tasks of porting Primordia and Resonance. As for new games? We have three in the works. If you follow us on Twitter or Facebook, you probably know what they are. We haven’t officially announced them yet, although we haven’t been keeping them a secret. More on that in the new year! So – hi! Welcome to the new blog. As you might be aware, I had a blog of sorts over at good old Blogger. It had a good run before slowly running out of steam. I’ve always felt kinda bad about that. There were several reasons for this. We have a toddler running around now, which certainly puts a crimp on my internet time. Social media sites such as Twitter and Facebook have really become the most effective ways to the word out. #3 is the big one. Twitter gives me more social presence bang for my internet buck than blogging ever did, and it’s no coincidence that Wadjet Eye Games has grown exponentially due to its influence. However, I can’t help but MISS the personal connection blogging gave me. Some things just can’t be contained within 140 characters. As a central hub for ideas, thoughts, screenshots and general miscellany – it can’t be beat. So my resolution for 2015 was to bring it back. And here it is. One week early. I do have plans for this blog. As I said, Wadjet Eye has grown. For the longest time the words “Wadjet Eye” just meant me, and then grew to include Janet when we got married. Then one year ago we hired a full time artist (Ben Chandler), and then last month we hired our first full time designer (Francisco Gonzalez). We also work with dozens of developers, composers and writers and things; all of whom make these games what they are. So you won’t just be reading blog entries from me. You will also be reading entries from Ben, Francisco, and anyone involved in the games we are publishing. You might also have noticed that this blog is no longer being hosted by Blogger. I’ve decided to pull up stakes and move the blog over to the Wadjet Eye Games website. While it means a bit of work in the short run (keeping the software updated and slaying spambots is almost a fulltime job) I still think it’s a good idea. Making a post on Blogger almost felt like a waste. If I’m going to do something like write a blog piece, I am doing it in the hopes that you’ll come and read it. So if you’re going to go to a website to read a thing I write, why not come HERE? To this website. With images of my games all up in your face. Who knows? Maybe you’ll stick around and buy something. I certainly wouldn’t object.